The second group of students from North West Agriculture & Forestry University (NWAFU) in China’s Shaanxi province has just completed an extended visit to The University of Adelaide. Comprising a week of contextual English language study and three weeks hosted by the School of AFW, the past month has seen the students engage in study, cultural activities and field trips, culminating in a visit to Kangaroo Island. Their lectures and practicals exposed them to a wide range of disciplines and some of the challenges inherent in South Australian agriculture. The group learned about cool-climate viticulture, dryland farming/broadacre crops and visited an apple orchard on KI. 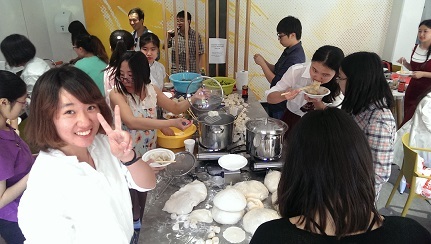 The students (pictured making dumplings for Chinese New Year) are third year undergraduates from viticulture, oenology and horticulture courses, so brought a broad range of interests to the program. The School of AFW has already sent three groups of students to NWAFU and will continue to build the educational partnership between the two Universities. This entry was posted in School of Agriculture, Food & Wine, Uncategorized and tagged students, visitors. Bookmark the permalink.